Data points are represented by a box where the height (width) of the box is the distance between the point’s high value and the point's low value. Bars may be either horizontal or vertical depending on whether the categorical axis is specified as an X-axis or as an Y-axis. RangeBarSeries class inherits from the RangeSeriesBase class - See the inherited properties. CombineMode: Gets or sets the combination mode to be used when data points are plotted. The RangeBarSeries supports only a Cluster CombineMode. PaletteMode: Gets or sets the target type of the chart palette, specified to the owning Chart instance. Defaults to PaletteTargetType.Series. Series: Applies the palette per series. DataPoint: Applies the palette per points. LegendTitleBinding: Gets or sets the binding that will be used by any attached legend to display legend item title. 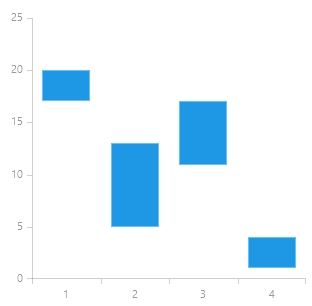 Here's an example of how to create a RadCartesianChart withRangeBar Series.